On my way back from the Machan, I finally made it to the Celebrity Wax Museum in Lonavla. And it's the first of it's kind in India. I have passed it a few times but have never made it there. I would always see the hoardings on the Expressway and be bursting with curiosity. It's a wax museum in Lonavla for God's sake! Now it's no Madame Tussaud's but it's still pretty awesome. - With it's random selection of wax figures. - And it's in Lonavla! 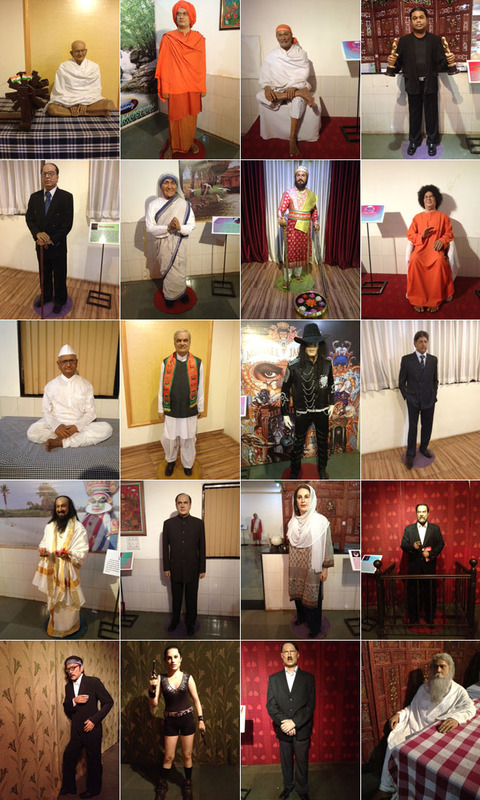 The Celebrity Wax Museum is by Mr. Sunil Kandalloor. He says that it takes him a month to complete a wax figure. And also mentioned how hard it is to get appointments with the 'stars' in Bombay. I suppose they all want to be showcased in London. And neither of us have changed! Please note: I'm not a fan of Hitler. Especially when you have a wax museum in Lonavla. I commend Mr. Sunil Kandalloor for building this museum. and his complete craziness for actually going through with all of it. Because how often would you be able to say that you spent an afternoon with Angelina Jolie and Saddam Hussein. The Celebrity Wax Museum is open all days of the year from 9 am to 9:30 pm. Tickets are priced at Rs. 100 for an adult and Rs. 80 for children. And it's free for those below 5 years or under 120 cm.